A bullish divergence hints of a rise in stock prices while a bearish divergence hints of a decline in price. When you see divergences in the stock and the indicator, you need to start paying attention. Odds are, the divergence will tell you that the stock is about to move up or move down in the near future. Many traders make a living in the markets playing bullish and bearish divergence. 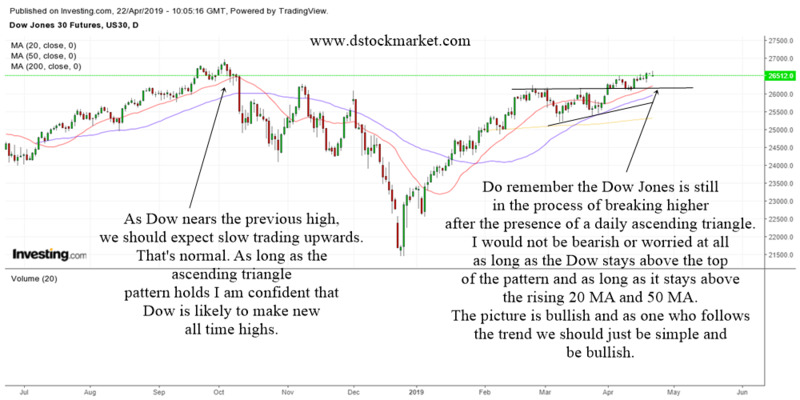 It may sound confusing at first but as you study the charts and the indicators below, you will soon be able to spot the nice moves that many traders have spotted in the past. For your information, I only use 2 indicators as divergence indicators. There are probably many more other indicators that can be used to spot divergences but I believe less is more. I use the MACD and the stochastics. Feel free to use other indicators to spot divergences. A bullish divergence occurs when the stock is making lower lows or same lows but the indicators are making higher lows. If a stock is going lower but the indicators are moving higher, it tells us that the stock has internal strength. More often than not, the hidden strength will help to propel the stock higher in the near future. Therefore, many traders love to play divergences because they can make money in 1-2 weeks time. 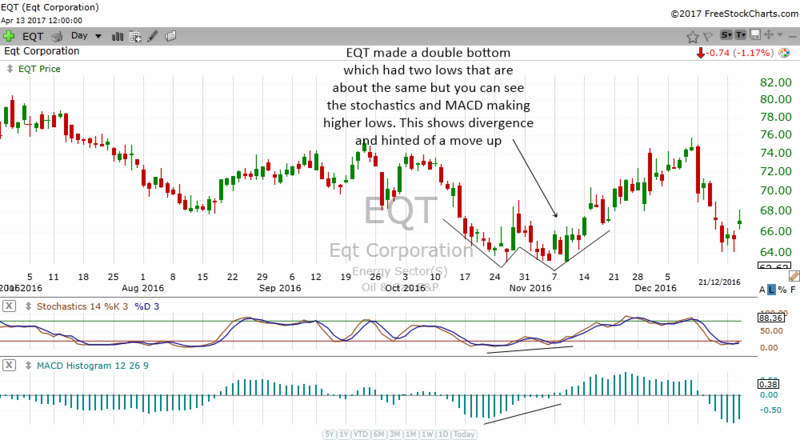 In the chart above, EQT was making a daily double bottom. Although the stock did not make a lower low, it made the second bottom around the same price as the first low. On the other hand, the stochastics indicator was showing some slightly higher low. It was very obvious in the MACD histogram. This told us that there was internal strength in the stock. Combining this divergence with a double bottom reversal pattern made it a very reliable reversal situation for traders. Look how the stock rose for a few weeks. 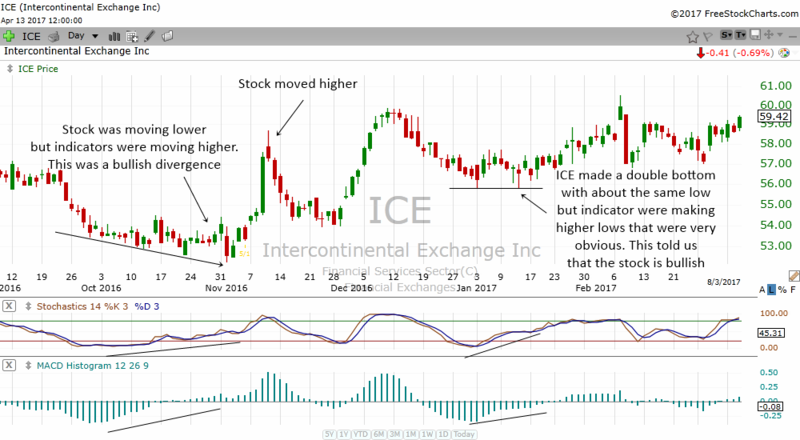 The chart of ICE above is very interesting. There were two bullish divergences in the stock chart. The first one was in Oct to Nov when the stock drifted lower. But when you look at the stochastics indicator and the MACD, they were moving higher. This told us clearly that there was a bullish divergence. Traders who were waiting for the stock to move higher and was ready to pull the trigger made some nice profits as the stock shot higher. The second bullish divergence happened in January. The stock was making some kind of a double bottom pattern and my...the divergence was so obvious. The indicators were making such a beautiful divergence that is was so easy to spot even for a beginner. Look how the stock moved higher for a few weeks. Bullish divergences not only happen in daily charts. They also happen in weekly charts as well. 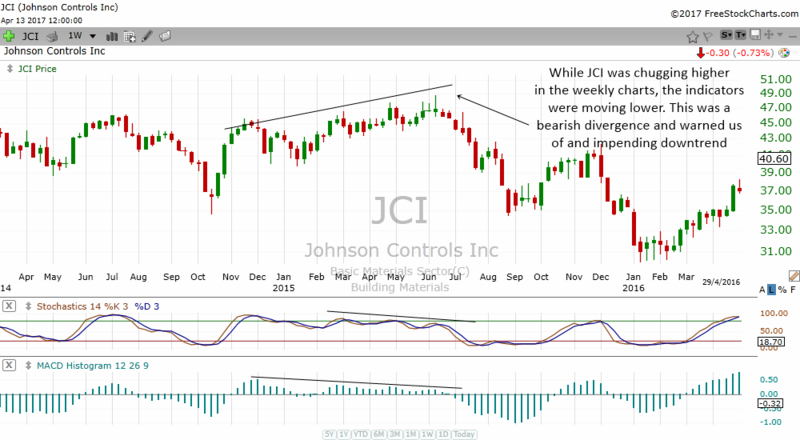 The JNJ chart above is a very good example of how bullish divergences can work in the weekly charts. 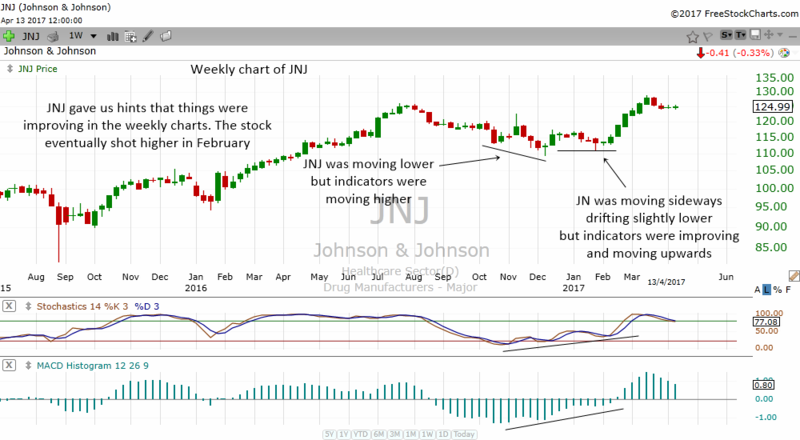 From October to December, JNJ was drifting lower but the indicators were rising. 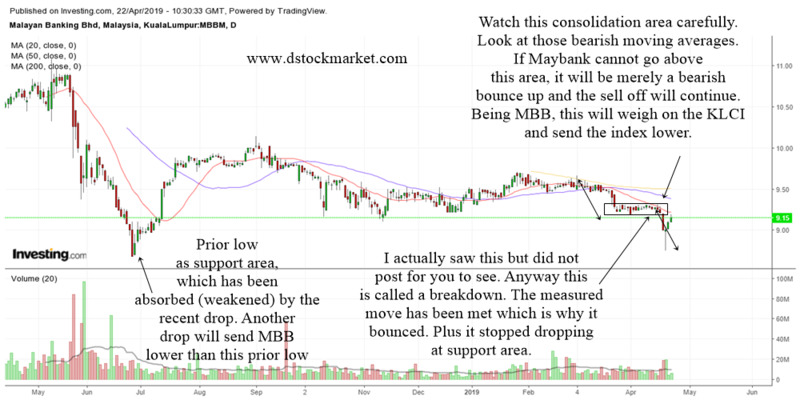 From December to February, the stock was moving sideways and drifting lower just slightly but you can see that the overall pattern of the indicators was up. This gave traders a hint that this stock had internal strength. JNJ soon moved higher. 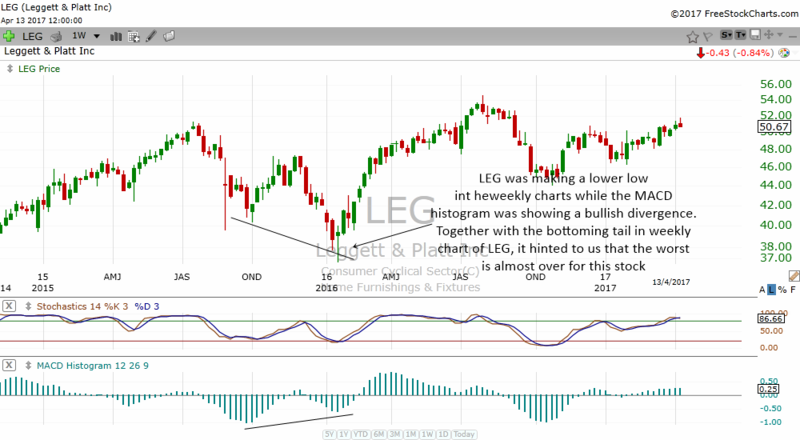 The weekly chart of LEG above shows how the stock made lower lows but the MACD made a higher low. This was a bullish divergence and investors or traders who had sharp eyes and saw the divergence along with the bottoming tail would have profited handsomely as this stock bottomed and rose higher. Bearish divergence works the opposite of bullish divergence. They hint to traders and investors that the stock is not as strong as it seems. Therefore, a correction or even a new downtrend may soon follow. A stock is said to experience a bearish divergence when the stock makes a higher high or same highs but its indicators make a lower high. This tells us there is internal weakness in the stock and the observant trader should take the appropriate action. 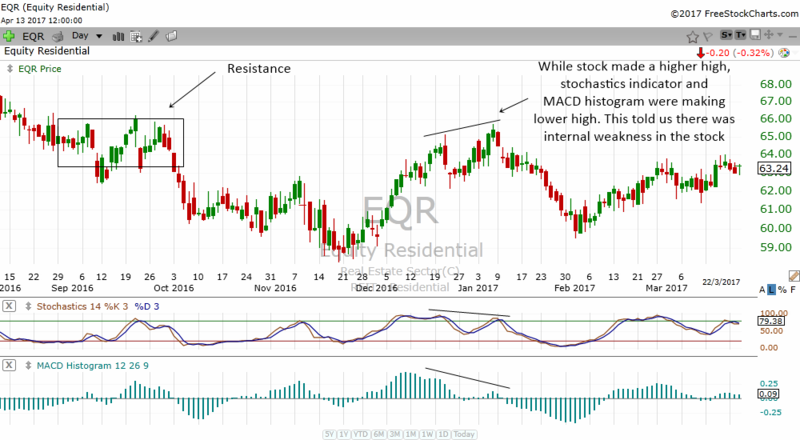 In the chart above, EQR was making higher highs in January 2017 but its stochastics and MACD histogram was telling us a different story. The indicators were not making higher highs like the stock price. 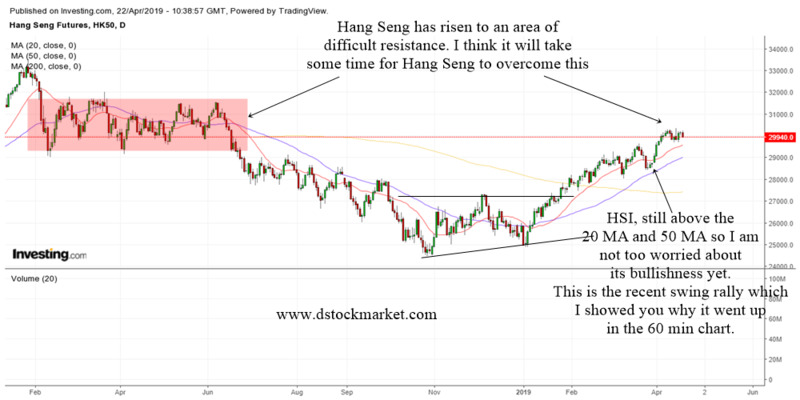 When you combine this with the fact that the stock was hitting resistance, it gives the trader a very potent warning that a correction may follow soon. The stock eventually went lower from mid January to February. Sometimes a bullish divergence and bearish divergence can appear in a stock chart one after the other. 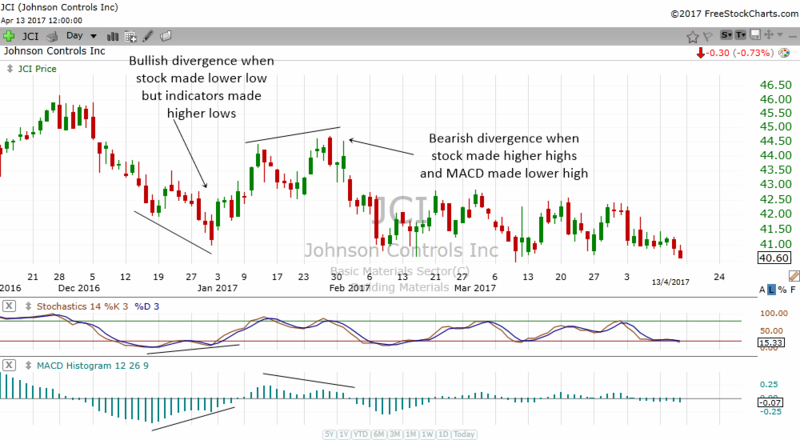 JCI gave us a perfect example why we should always be aware of bullish divergence and bearish divergence. It helps us to be realistic and objective. From December to January, the stock made lower lows while the indicators made higher lows. This was a bullish divergence and the stock rose higher. Then in mid January to February, the stock made higher highs but the MACD made a lower high. Although only one indicator made a bearish divergence, it was enough to keep the stock from rising further. A stock that is in a weekly uptrend should also be suspect when the indicators are not making higher highs. Take a look at the weekly chart of JCI above and you will understand. While the stock was chugging higher from November to June, the indicators were actually making subtle signs of lower highs. The observant investor would start to suspect the health of the weekly uptrend and take the appropriate action. Bearish divergences work very well in weekly charts as well. 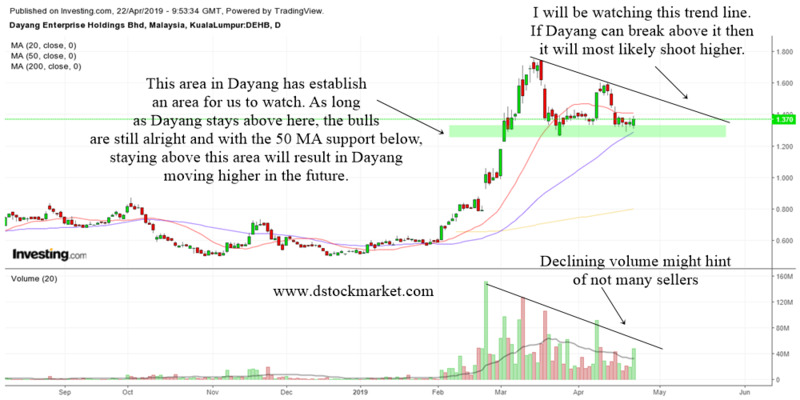 You just need to be very observant and you will see that a stock seldom make a top without giving us some hints. 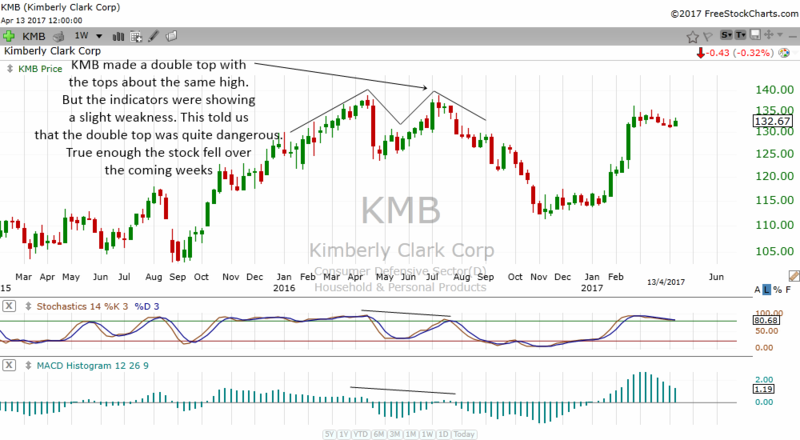 KMB was making a double top pattern in the weekly charts above. Notice the indicators were not making the same highs. 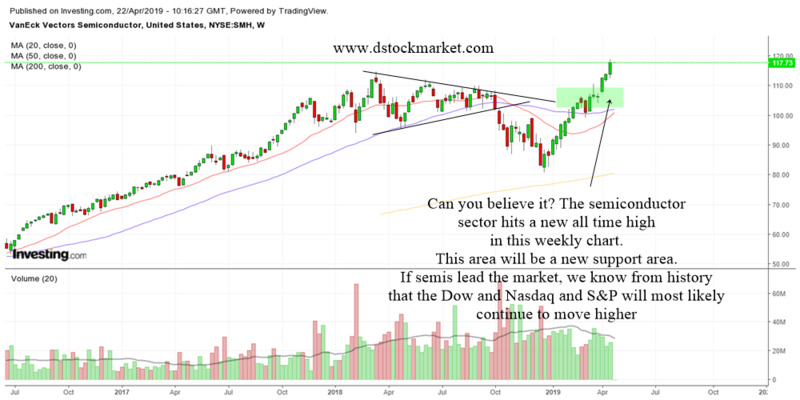 It was very subtle but the very fact that the indicators were showing some small divergence when the weekly chart was showing a double top would have warned the observant investor that perhaps this stock is not as strong as it seems.